The Iolite Wispr 2 Vaporizer has several upgrades from the previous model such as a nifty viewing window, rubber bendable mouthpiece and 2-step activation switch. It reaches 410 F in about 30 seconds which is impressive for a portable vaporizer. The controls have been improved as well through a 2 step switch that turns on the gas and depressing it again ignites it. These improvements are a very welcome addition to an already solid product. After filling the Iolite Wispr 2 Vaporizer with butane fuel, load up the herb chamber with your favorite herbs. Depress the 2-step switch to its first position to turn on the flow of gas, press it again to turn on the igniter and then the unit will reach its optimum vaping temperature in 30 seconds. This unit comes with a viewing window that allows you to see the remaining fuel inside the unit. The case is re-designed to be cooler while you are using the unit for extended periods. Wispr 2 by Iolite Vaporizer comes complete with limited 2 years Warranty, restricted to normal use. The Wispr 2 by Iolite Vaporizer is guaranteed to be free of manufacturing defects and in proper working condition when you receive your order. Should your order arrive and the Wispr 2 by Iolite Vaporizer is defective, a replacement will be provided free of charge. 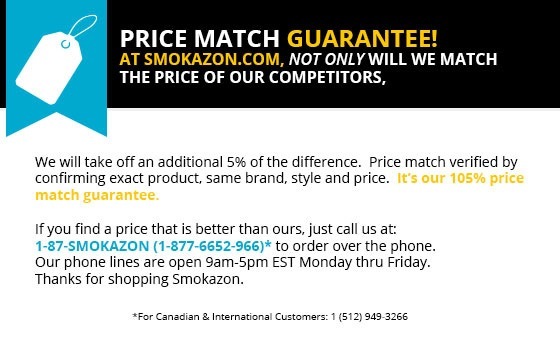 To obtain your replacement, contact Smokazon.com within 7 days of receipt of your order.